Treating a dairy lagoon with Effective Microorganisms® (Activated EM•1). This 20-foot deep lagoon had built up 14 years worth of solids with 15 feet of solids and 3 feet of crust. It is located in Southern New Mexico. 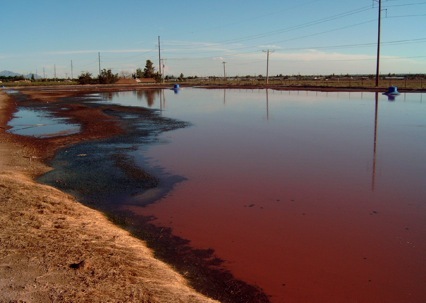 In 2006, the first attempts to remediate the problem was to institute the California BMP (Best Management Practice) of using microorganisms and aeration. Activated EM•1® was dripped very slowly into the water, at very low rates to keep costs down (only 100 gallons per year), and 4 'Blue Frogs' were introduced. Slowly open water began to emerge on the surface. The cost of this treatment was not low. The microbes ran ~$200+ a month and the aerators cost ~$8,000 each and cost ~$1200 a month to run. This did not work exceptionally well. Therefore, the farmer decided to step up the program with the Activated EM•1® and shut off the aerators. In February of 2008 a new program was put in place with the help of TeraGanix technical specialists. The photos and video show the transition of the lagoon over the 8 month period. The lagoon holds about 3.5 million gallons of dairy effluent. The new program was to put 300 gals of Ag1000™ every 2 weeks for 3 months and then 300 gallons per month thereafter. wet and then rise again. This is evident in the photos, especially during the first few months. Colors began to change and a reduction of solids was at about one inch per month. The surface level did not decrease as the solids became more liquid and began to expand. A long rod was used to probe the density of the solids. It began to go further in and released a large amount of bubbles indicating the increased biological production of gases as the solids liquefied. The lagoon also lost any objectionable odors. (cellulose and lignins). Logically, since this is a common problem in all diary lagoons, lagoons using similar BMPs will likely begin to build solids and will eventually need pumping or dredging. Activated EM•1® dditional natural microorganisms that dramatically increase digestion of solids and control of wastewater odor. After the first three months the amount of Activated EM•1® at each treatment was reduced to 300 gallons per month. The following pictures represent the evolution of recovering the lagoon from April 2006-September 2008. By August 25, 2008 the colors were getting vibrant with lots of off gassing. The red/crimson colors are an indication of a major photosynthetic bacteria bloom. There is almost no odor and the entire lagoon is full of bubbles and bottom turnover (gases raising large chunks of bottom to the surface). The bottom is becoming very soft as the solids are being loosened and reduced. The many types of algae seem to indicate that there is sufficient oxygen (low BOD) and the lagoon appears to have become self-regulating (maintaining a balance of needed aerobic and anaerobic microorganisms).